Zachary Zill authored a set of Green Building Guidelines and created a Life Cycle Analysis tool to look at the life time costs of capital expenditures for sustainability projects at Vassar College. Vassar College was in the midst of finalizing its first ever Climate Action Plan when it began to develop a new Master Plan for major renovations and building upgrades over the next twenty years. Unsure of how to integrate the two, EDF Climate Corps fellow Zachary Zill was brought onboard. Vassar, lacking a system for long-term cost control, and basing capital spending decision largely on achieving the lowest up-front price tag, often executed projects with little sustainability input. Making matter worse, a large backlog of deferred maintenance put a drag on the college’s building performance. To overcome these challenges, Zack was tasked with creating a systematic plan for achieving energy use reductions in the campus’ building stock. 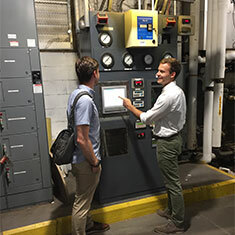 Using Vassar-specific utility rates and emissions factors, Zach developed a Life Cycle Cost Analysis tool to forecast the long-term cost and emission reductions of capital projects and upgrades to the physical plant. The tool also allows the college to set an internal price on carbon in capital spending and adopt a green revolving fund by creating a consistent template for financial and GHG comparisons across different projects. In addition to this, Zach authored a set of Green Building Guidelines. The procedures will help Vassar manage risk and find direction as it embarks on the next phase of major capital projects designed to achieve its sustainability goals. This formal process for setting energy reduction goals in capital projects ensures that the college will secure a high performing building stock. The LCCA tool and Green Building Guidelines will allow Vassar to save over $400,000 from its annual operating budget within the next fifteen years. Zach’s recommendations will yield 2.5 million kWh of electricity savings and will help the College reduce its emissions by over 1,800 metric tons of CO2e per year. Zach Zill is a MS candidate in Columbia University's Sustainability Management program. He has worked in the building industry as everything from a carpenter to the regulatory coordinator for a large urban infrastructure project. When he's not working, he enjoys playing and watching soccer.